Growing food in community and home gardens can provide people with more access to fresh vegetables for a healthier food supply, according to a new study. University of California and Santa Clara University researchers surveyed people in San Jose who maintained a garden in their yard or a community garden and found that gardeners consumed more vegetables when they were eating food grown in their gardens. 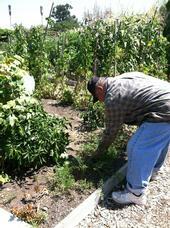 A Santa Clara County resident works in a community garden. People who grow their own vegetables in a garden typically consume enough fresh produce to meet the USDA Dietary Guidelines for a healthy diet, according to a recent UC Cooperative Extension survey of San Jose residents. A diet containing lots of vegetables is lower in calories and higher in fiber and good for our health. Yet, not everyone has easy access to fresh vegetables in the United States. On Saturday, March 31, Angelenos celebrated the Mayor's "Good Food Day of Service." Los Angeles Mayor Villaraigosa, the Los Angeles Food Policy Council, and numerous community partners organized this city-wide event to highlight the importance of healthy food and celebrate the legacy of César Chávez. There were 100 participating sites around the city, all featuring community service focused on healthy food access. Growing your own food. Raising awareness of food and environmental injustice. And creating a green community. These are the goals of the UC Riverside community garden initiative called Cultivate R-Space. At the community garden – a student-run “living experiment” that partners with UCR Sustainability – students grow and harvest their own food such as tomatoes, squash, potatoes and lettuce. Those who want just the experience of working in the garden grow flowers.